The Google Nexus 4 uses a Qualcomm APQ 8064 Snapdragon S4 Pro chipset, which packs the new generation Krait CPU cores and the new generation Adreno 320 GPU. The Samsung Galaxy S III meanwhile relies on Cortex-A9 CPU cores and Mali-400. As it turns out, the older design holds up very well against the powerful newcomer and wins several rounds, though as we've noted before, it's more because of optimization than having comparable raw power. Let's start with the CPU performance. The Google Nexus 4 posts a slow time in Benchmark Pi - slower than both the Galaxy S III and the LG Optimus G. It wins out in Linpack, but not by a big margin - it's on the level of the Galaxy Note II, which uses the same chipset as the S III but clocked higher. Geekbench 2 puts the Galaxy S III above the Optimus G, but the Nexus 4 came out on top. 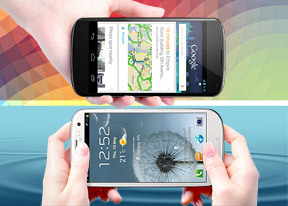 AnTuTu and Quadrant both test overall system performance and their opinions are split - AnTuTu puts the Nexus 4 comfortably on top, while Quadrant rated the Samsung Galaxy S III higher and put the Nexus at the bottom. Moving on to GPU performance, the newer architecture has a clear advantage - it offered nearly 75% higher framerate in the off-screen GLBenchmark 2.5 test (1080p resolution). It practically matched the iPhone 5, which uses some of the most powerful GPU cores around. Oddly, the off-screen GLBenchmark 2.1 test (720p resolution) showed lower framerate for the Nexus 4 than the Galaxy S III. The Google Nexus 4 comes with Chrome out of the box, while the Samsung Galaxy S III uses the stock Android Browser with some TouchWiz tweaks. Vellamo, another compound web browser test, puts the S III near the top and the Nexus 4 at the bottom. After all these benchmarks, we have no solid answer to the question of which phone is faster. On average, the Google Nexus 4 is faster - CPU benchmarks favor it (especially in multithreaded tasks) and the GPU victory was pretty decisive. Results seem very dependent on the software, however. The Samsung Galaxy S III won its fair share of benchmarks. Whatever modifications Samsung have made to the browser seem to have really boosted performance and GLBenchmark 2.1 reported a higher framerate for the S III than the Nexus. In the end, both phones are powerful enough to handle any task they're given. But the Nexus 4 has room for improvement, the Optimus G (which differs from the Nexus by software only) beat it in several key benchmarks. Winner: Google Nexus 4. It may not have won outright, but benchmarks leaned in its favor overall and the S4 Pro chipset has potential that can be unlocked with a software update.